I think we all know of a few ‘amazing’ stories about thoroughbreds rescued from the brink of going to slaughter and going on to be amazingly talented horses performing to Olympic level. I am also sure there are thousands of stories where thoroughbreds have been re-homed and re-educated to be dependable, talented riding horses. The fact it can be done though doesn’t mean it is an easy task. Many thoroughbreds, and especially those who have raced take a lot of time and patience to re-educate and re-condition to live and work as a pleasure or performance horse. While there is no doubt that good education from a ‘steady hand’ is of utmost importance in a thoroughbred’s ‘transformation’, a large part of their transition from racehorse to riding horse is dependent on good nutrition. In this newsletter we will look at the rather unique situation of feeding an off-the-track thoroughbred and the strategies you might use to get the best results. In a survey we conducted in 2001 while I was a student at UNE that was later published in the Australian Veterinary Journal (Richards et al 2006) we found that thoroughbreds in racing stables are fed an average of 7.3 kg of grain based feed per day. Some trainers fed as much as 13 kg of grain per day and feeding just twice a day was the norm. Oats was the most commonly fed grain while corn, barley and commercial feed mixes were also popular choices. It was uncommon for trainers to use ‘cooked’ grains. As a result of these high grain diets fed in large meals where much of the starch would be considered indigestible in the small intestine we found that around 25% of horses were experiencing hindgut acidosis. To make things worse for these horses very little forage is fed. Less than 1 kg/day of chaff was fed by a majority of trainers while horses only received hay an average of 1.5 times a day. We didn’t actually weigh the hay but the amount was small (probably around 2 kg/horse/day). Essentially what you are likely to end up with when you take a thoroughbred directly from the racetrack is a horse whose gut has adapted as best it can to high grain diets and in the process has lost some ability to do well on high forage diets. An imbalance of the bacterial species in the hindgut. The horse’s hindgut contains two main ‘families’ of bacteria, those that ferment fibre and those that ferment starch and sugars (there is a 3rd group called lactate utilising bacteria but for the purposes of this topic we shall just focus on the two main families).What you would find if you could ‘see’ these two families of bacteria in the hindgut of a healthy horse fed a largely forage based diet is large populations of the fibre fermenting bacteria and much smaller populations of the starch/sugar fermenting ones. This however would be the opposite in a recently raced thoroughbred. You would see the starch/sugar fermenting bacteria in abundance while the fibre fermenting ones would be only in very small numbers. To make things worse, even though some fibre fermenting bacteria would still be present, the acidic environment the starch/sugar fermenting bacteria create means the fibre fermenting bacteria can’t function very well.What this all means is that fibre fermentation and therefore the horse’s ability to extract digestible energy from pasture, hay, chaff, haylage or high energy fibres like sugarbeet pulp, soybean hulls, lupin hulls or copra meal is severely limited. They might be eating a lot of fibre but will be able to digest very little of it. Gastric Ulcers. It is estimated that as many as 90% of horses in race training have gastric ulcers. Gastric ulcers cause many problems but perhaps the two most relevant in the situation of feeding an off-the-track thoroughbred are the loss of appetite and weight loss. To get these ex-racehorses looking and feeling ‘normal’ they need to eat and they certainly don’t need anything like gastric ulcers to be causing further weight loss. Hoof problems – Shelly, weak hooves that grow slowly are common issues seen in off-the-track thoroughbreds. Horses rely on biotin produced in the hindgut as well as dietary biotin to grow strong, healthy hooves. I believe, that largely due to the imbalance of bacteria in the hindgut, racing horses become biotin deficient and this is why we see so many with horrible hooves. Poor appetites – It is quite common for ex-racehorses to have poor appetites. In many cases this is probably due to gastric ulcers but it may also be due to a vitamin B1 deficiency. As for biotin, horses rely on vitamin B1 being produced by the fibre fermenting bacteria in the hindgut to meet their requirements. When horses have a large amount of starch being fermented in their hindgut very little vitamin B1 is produced. And what is worse is the starch/sugar fermenting bacteria also produce ‘thiaminase’, an enzyme that actually destroys vitamin B1 in the gut. Both factors combine to create a vitamin B1 deficiency that is well known to cause a loss of appetite. The first critical step in getting a thoroughbred back to ‘normal’ is to restore the balance of bacteria in the hindgut and get fibre digestion working properly again. If you have the time, this is easily done by simply putting the horse on a forage only diet with as much forage available as the horse would like to eat. Over time, the starch/sugar fermenting bacterial populations will fall (because you simply aren’t feeding them their preferred food anymore) and the fibre fermenting bacterial populations will SLOWLY be restored. The fibre fermenting bacteria are somewhat slow to reproduce so this isn’t something that is going to happen very quickly. You may also find that particular species of fibre fermenting bacteria have almost completely disappeared from the hindgut (something you really can’t test for) so it takes a long time for the population to get back to normal. Many people ask if probiotics will help. The simple answer is no, the majority of them won’t. Many probiotics are designed to assist with killing or suppressing pathogenic bacteria in the gut and they predominantly contain lactobacillus species of bacteria. Lactobacillus are starch/sugar fermenting bacteria and one of the groups of bacteria you want to reduce numbers of, not increase. What may help is stomach tubing the horse with a strained slurry of manure taken from a healthy (worm free) horse on a high forage based diet (take the manure from the healthy horse while still very fresh, mix it in a slurry of body temperature clean water, strain the large particles and drench with the remaining watery solution – this must be done by a vet to avoid distending the stomach with too large a volume of fluid). This strategy is used with great results in feedlot cattle affected by acidosis to repopulate the rumen with ‘good’ bacteria. Of course in a horse the bacteria have to survive passage through the gastric stomach and small intestine, but it is likely some will survive and make it to the hindgut. Pre-biotics that help to feed fibre fermenting bacteria (generally yeast based products) may also be useful. While this process of rebalancing the hindgut takes time it is essential if you want to have a horse that has a gut that functions normally. To a large extent getting the hindgut functioning normally will correct issues the horse may have with its hooves being weak, shelly and/or growing slowly. Once the fibre fermenting bacteria are back and producing biotin again you should see good improvement in hoof quality (assuming requirements for nutrients like copper and zinc are being met). You may however like to use a hoof supplement to provide additional biotin to the horse in the short term. It is recommended that to positively impact hoof growth you should feed 20 mg of biotin per day for a 500 kg horse. If you do wish to feed biotin, use FeedXL to help select your hoof supplement. The amount of biotin in the diet is on the ‘Health’ tab. 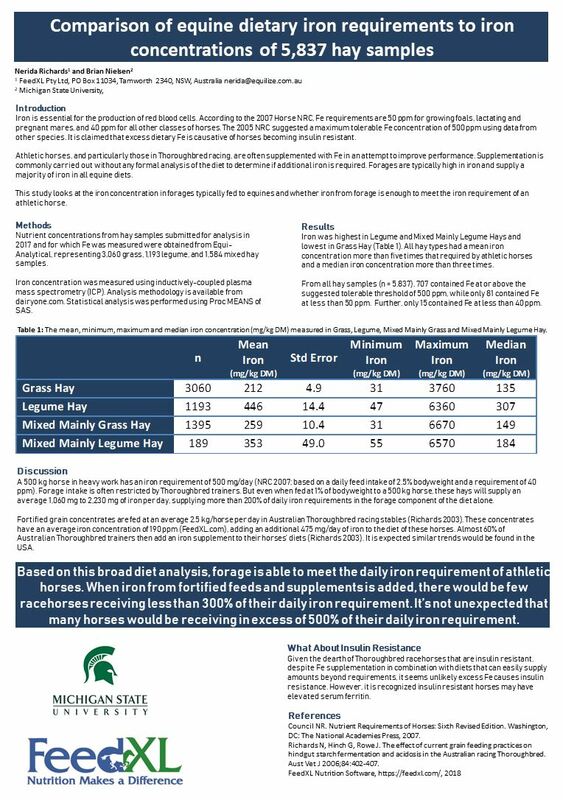 This will guide you in working out dose rates to meet your horse’s requirement for this nutrient. Again getting the hindgut rebalanced will go a long way to improving the appetite of off-the-track thoroughbreds as they will be able to correct any vitamin B1 deficiency that may have been present. You can also use one of the many appetite or vitamin B1 supplements on the market to try and improve appetite. But remember that gastric ulcers are likely lurking in the stomach of your new horse and until they are resolved a poor appetite is likely to be present, regardless of what you feed or how you try to tempt the horse. Gastric ulcers really must be treated so they resolve fully (talk to your vet about the most effective treatment options). There are some good US studies that show alfalafa/lucerne hay will help gastric ulcers to resolve given enough time. Incorporating alfalfa/lucerne into the forage base of the horse’s diet (up to 1 kg/100 kg BW or 1 lb/100 lb BW) may therefore also help to resolve ulcers and then to keep them at bay once treatment ceases. Once the ulcers are gone you should see a marked improvement in the horse’s appetite. 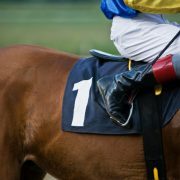 Often the biggest priority for the owner of a new off-the-track thoroughbred is to get the horse gaining weight. While you could ‘feed the heck out of them’ and give them large amounts of grain based feed to put weight on them you are going to miss the opportunity in doing this of getting their entire gastrointestinal tract functioning ‘normally’ again. If you force weight gain with grain based feeds many of the problems discussed above will still be present and the horse still won’t be utilising fibre very efficiently. The end result is a horse that will need A LOT of feed to hold its weight long term (which is going to cost you a fortune). So if time is on your side and you can be patient, hold off on pushing for weight gain until your horse has restored the balance of bacteria in its hindgut again and can properly utilise the fibre in its diet. Once it can do this you will find it takes a whole lot less feed to put weight on them. It is also crucial that any problems with ulcers have been resolved and that appetite has been restored before any attempt to put weight on the horse is made. A note about fence walkers – Separation anxiety and fence walking is a common problem with newly off-the-track thoroughbreds. Given they are raised in groups and are virtually never left alone it is understandable. But if you think about it, a horse walking a fence instead of grazing has a high energy output and a low energy intake … there is no way you are going to put weight on a horse doing this. If you have a fence walker that needs to gain weight you are going to need to find it a buddy who is calm and spends a lot of time grazing and sleeping. The sooner your new horse can learn to do this the better. Thoroughbreds are certainly capable of gaining and holding a lot of weight. It is just a matter of getting their gut (relatively simple) and their mind (sometimes not so simple … is that diplomatic enough?) sorted out. I see overweight thoroughbred weanlings, yearlings and broodmares all of the time, they are common. So with some patience and strategy you will be able to get weight on and keep weight on your horse. Thoroughbreds are typically thought of as being quite ‘hot’ – the “react and then think” types. This issue is compounded when you take a horse that only has very basic education, straight off the race track and immediately start trying to ride it at the same time as you are trying to feed it a high energy diet for weight gain. Again, patience is king here. Give the horse time to adjust to its new environment and in the early stages of its re-education feed a very basic (but still balanced diet, be sure to use FeedXL to make sure all nutrient requirements are met), high forage, moderate energy diet with no grain. The more education you can give a horse before you really start feeding it ‘the good stuff’ for weight gain the better. Month 1 – Put the horse out to pasture or give it access to ad lib good quality grass hay and feed 1 kg/100 kg BW of alfalfa/lucerne per day. Use FeedXL to balance the diet correctly using a pasture balancer pellet or low dose vitamin and mineral supplement. If possible just let the horse be a horse without any pressure to be ridden or trained (other than to have good ground manners if these are lacking). You should treat the horse for ulcers where applicable, have a faecal egg count done and worm appropriately and have teeth/hooves etc attended to by qualified professionals during this first month. Months 2 to 4 – Depending on the how the horse is going and how well its hindgut is functioning by the second month you may be seeing an improvement in condition or a worsening of condition. If the horse’s condition is dropping away check for issues like ulcers (they could still be present), general anxiousness (is the horse pacing the fence constantly) or pain, for example a back injury that is making it uncomfortable for the horse to graze/eat properly. During these months you may begin to add some high energy feeds but if the horse’s hindgut still doesn’t appear to be functioning correctly (eg its manure consistency is still not right or it is still really struggling to hold weight on a high quality pasture/hay diet) I would try to stay away from grains and grain based feeds. Use ingredients like grain free complete feeds (FeedXL will help you find truly grain free feeds), lupins, sugarbeet pulp, soybean or lupin hulls, full fat soybean and copra meal. If you are going to start riding the horse during this time these feeds might also help to keep your horse a little more level headed. Just mind you don’t give it a very high energy diet before you start riding it – for some horses that is just asking for trouble. Months 5 to 12 – I would hope that by the 5th month the horse’s hindgut is back to normal or at least close to normal and by this time the horse will have semi-adjusted to its ‘new’ life. At this point in time you can consider other feeds including those based on grain. But PLEASE be sure to use cooked grain based feeds because the last thing you want to do at this point in time is put any sort of starch back into the hindgut. The horse’s temperament and need for weight gain at this stage will determine how much feed you can feed. Still use forage as the major component of the diet and try to avoid feeding more than 800 grams of feed (approx. 1 lb) per 100 kg BW per day, being sure to split it into as many feeds as practical during the day. You might also consider starting to add some high fat feeds like rice bran or straight vegetable oils to the diet for extra energy to help with body condition. At this point in time you need to be very careful to distinguish between condition/fat and muscle. Many thoroughbreds will look very thin when they are actually in good body condition, while they lack topline and general muscle. So be sure to use our Body Condition Scoring newsletter (#1) to help you determine if your horse needs more condition or needs to build muscle. The former can be done with feed alone. The latter needs a combination of high quality feed and the right work (as well as a horse that is fully sound with no back or other pain that will stop it from using its muscles correctly). The more time you allow an off-the-track thoroughbred to readjust to a forage based diet the better the results you will get. A racing thoroughbred’s gut is adapted to eating a high grain diet. Ultimately you want your off-the-track thoroughbred to have a gut well adapted to doing well on a high forage diet. It takes time for the gut to readapt itself, build the right populations of bacteria and to heal problems like ulcers. But it is time well worth spending (unless you want to continue spending a fortune on grain based feeds and still having a horse that is really difficult to put weight on). Taking it slowly in the first few months will mean you are going to get your horse where you want it to be sooner in the end. You will hopefully also be treated to a horse that is more relaxed and trainable than it otherwise would be if you try to put weight on too quickly using high energy feeds too early. This newsletter by Dr. Nerida Richards was originally posted to the FeedXL user forums for FeedXL subscribers in December, 2014. If you would like to be among the first to receive our newsletters then please consider becoming a FeedXL member or subscribing to our email list.